When your home is on the smaller side, little niceties in life like gift wrapping can be a real pain. I mean, it really isn’t fun to spend an hour searching out the birthday paper vs. the holiday paper, finding scissors and tape, then not being able to find the right color ribbon and having to run to the store at 10 PM, right? Wouldn’t it be nice if every time you needed to wrap, you had one place where you could find all the things you need? And wouldn’t it be nice to actually enjoy thoughtfully wrapping a present again? Ok, we know all the answers to these questions. No, yes and yes! 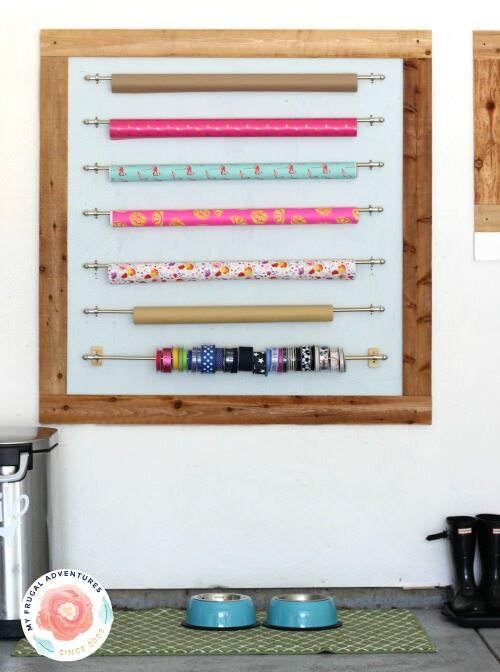 So we found you some great DIY projects to help you organize your wrapping supplies. Some of these projects allow you to create a permanent spot in the home, and some are totally portable so you can bring them out when you need them. So whether you are holiday wrapping for 20, or just want to wrap the perfect “I love you” present for Valentine’s Day with all the primp and glitz, these gift wrap organizing projects will have you “wrapping it all up” in no time! 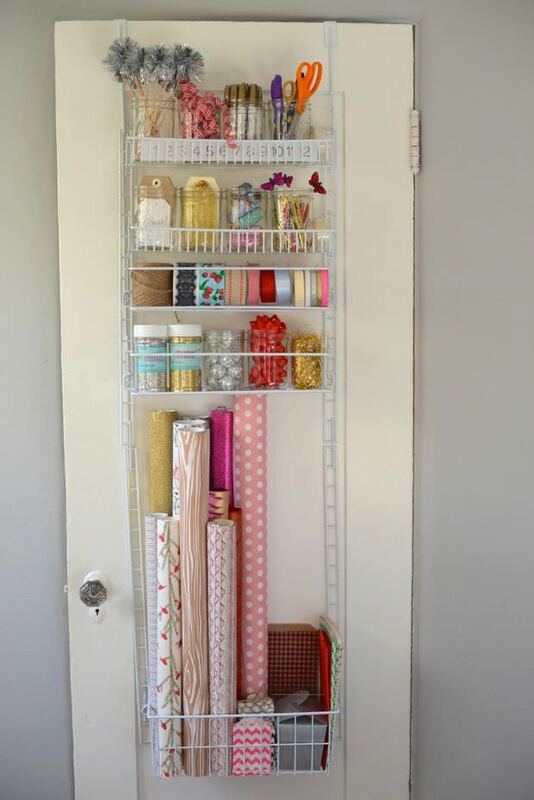 This DIY gift wrap station from ‘My Frugal Adventures’ was put on the garage wall to save space. I love how she has all the ribbons right there with the paper. I would also hang a basket on the wall holding tape, scissors and gift tags! Need something you can stash in a closet? 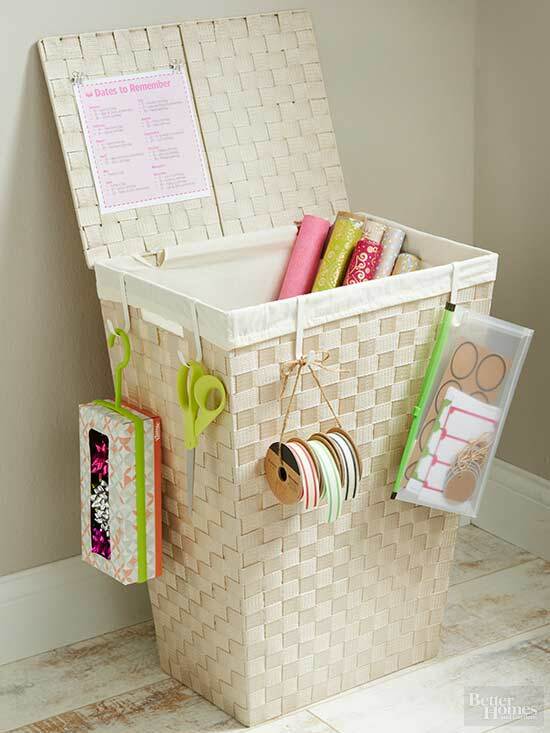 This party paper storage hamper from ‘BHG’ is perfect for storing rolls of wrap, with little s-hooks allowing you to attach all kinds of accessories. 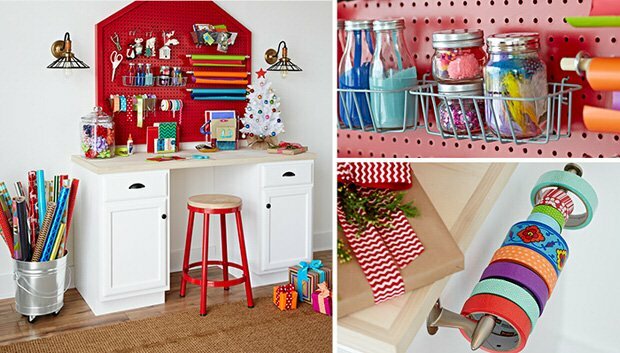 This gift wrap organizing project is a wrapping station from ‘Lowes’. This is a full tutorial with step by step instructions and diagrams. I realize not everyone will have the space to do something this intensive, but consider making a space you already have dual purpose, such as a garage or laundry room. Utilize the space on the back of a closet door (perfect for small homes!) by creating this DIY gift wrapping station from Emily at ‘Cupcakes and Cashmere’. For those of you who are just not into DIY’ing this project, this solution from ‘The Home Depot Blog‘ involves using 2 store bought wrapping stations, but I could see adding dowels to a nightstand or drawer storage unit as well. 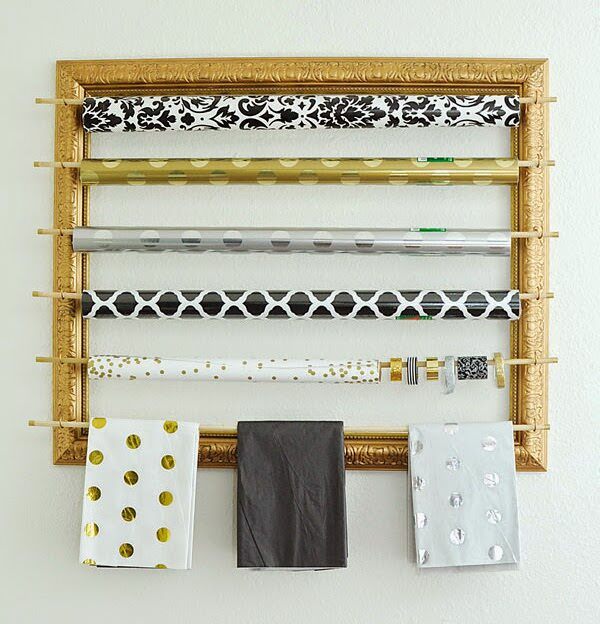 Loving this wrapping paper organizer from ‘2 Little Hooligans’! She used a magazine article as inspiration, and created this portable gift wrap organizer with a kitchen stool turned upside down. Perfectly ingenious! This DIY picture frame organizer from ‘Monica Wants It’ is another project just made for a small home (and budget!). Great way to use an old frame sitting in the garage or that you find at a second hand store. 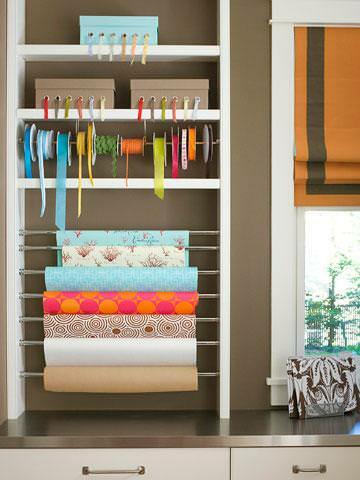 Create a whole closet gift wrap station using these ideas from ‘ Midwest Living‘. 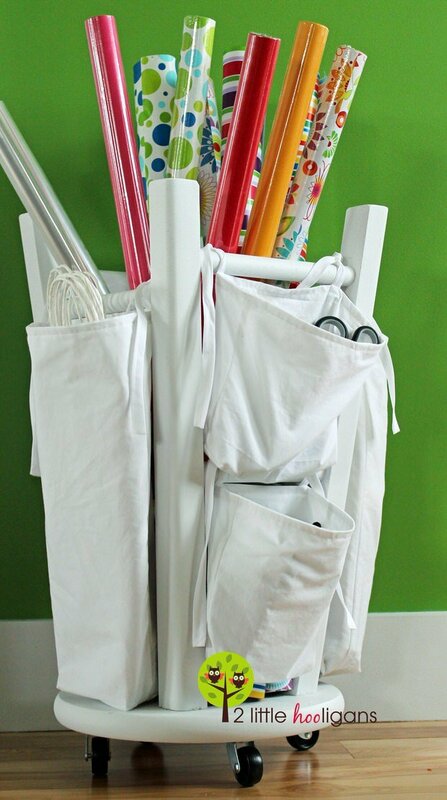 Add dowels or expandable curtain rods for rolls of wrapping, and use shelves for boxes of accessories. 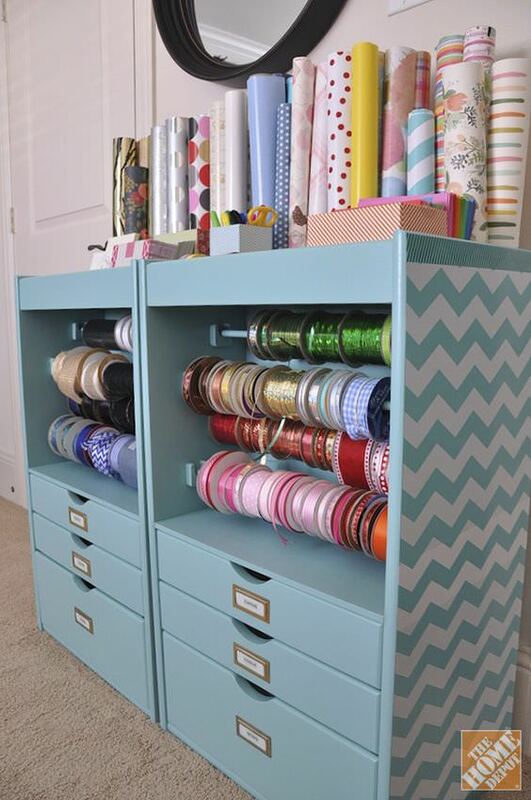 Lastly, if you are lucky enough to have a craft room (or even a craft space in an office or guest room!) 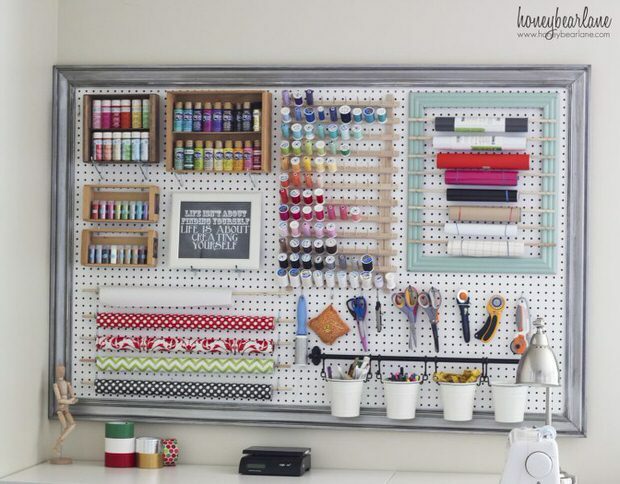 then consider making this craft room pegboard from Heidi at ‘Honeybear Lane’. You couldn’t be more organized than this, and doesn’t it just make you feel good to see all those tidy supplies just waiting for your creativity? Get wrapping! Got enough gift wrap organizing ideas yet? Now jump on over to Hide the Ugly, Indoors! Previous Post DIY TV Frame: Disguise Your TV!